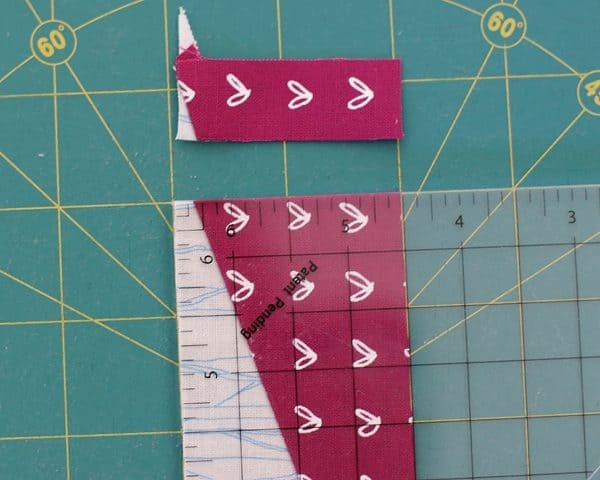 Ever wondered how to sew and trim half rectangle triangle (HRT) blocks? Well you’ve come to the right place! Let me show you how I like to do them. 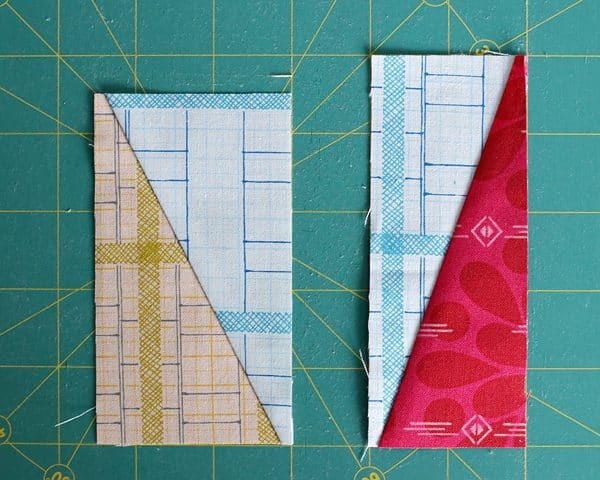 Half Rectangle Triangles add another fun shape to your quilt designing arsenal. You can make cool, elongated diamonds and zigzags and parallelograms and…long spikey things. The list goes on and on. What exactly is a Half Rectangle Triangle (or a half square rectangle as I often accidentally call them)? 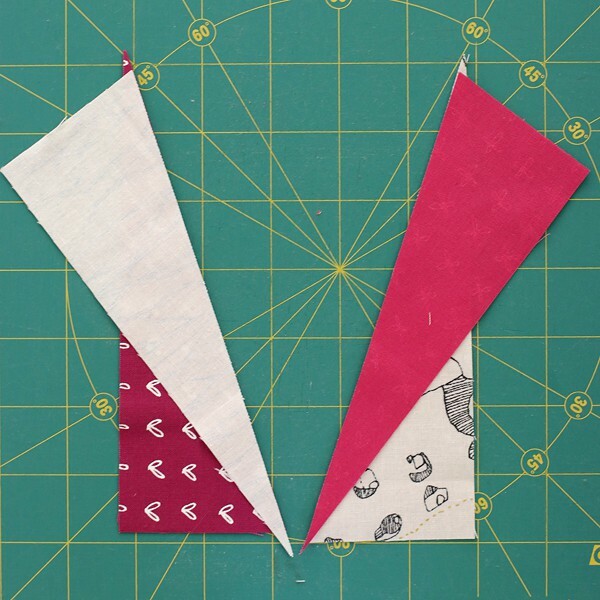 If you’ve made half square triangles (HSTs) before you might be thinking, no sweat, an HRT is just a stretched out HST. And you’d be right. After all, a square is just a rectangle with 4 equal sides. Being square, you can rotate an HST 90 degrees and still have an identical shape but with the diagonal seam reversed. Above: An HST block rotated 90 degrees each time – every diagonal option and colour placement option can be achieved with the one block. Oh yeah. If you rotate a half rectangle triangle 90 degrees to change the direction of the diagonal you will NOT have the same shape. Your long, tall rectangle will now be short and wide, or vice versa. Above: The HRT’s diagonal direction will determine the layouts. Here the 2 possible HRT blocks are rotated through 90 degrees. You can’t get every layout from only one HRT block. All that to say – when making half rectangle triangles you have to pay attention to the direction you need your diagonal to face. This isn’t tricky, but something to keep in mind before you race out and make a whole bunch. I have a couple of half rectangle triangle quilt patterns (this one and this one). You can see that this block can be used for some really fun shapes (especially in this one). The downside, for me, is that the set up is quite finicky (offsetting the diagonal and matching the lines). 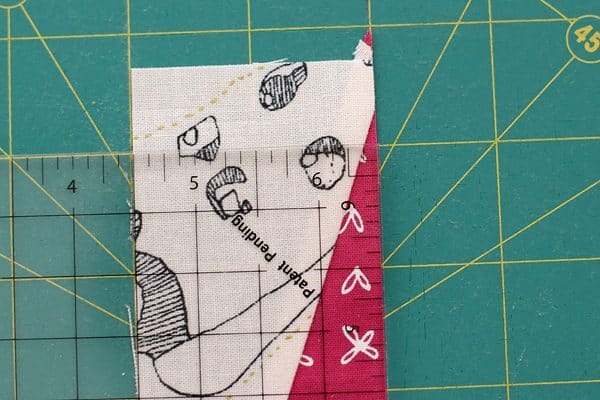 Given the sewing time I have usually coincides with my wine drinking time, I like to keep my sewing methods as straight forward as possible so I have fewer opportunities to make mistakes. The method I follow is very “make it like you see it” and it suits me better. Feel free to choose whatever suits you! 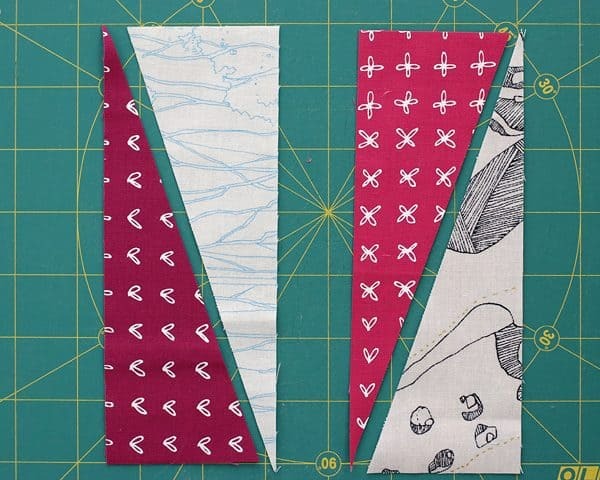 One other thing I like about this method is that it produces the half rectangle triangles one unit at a time – so I can mix and match halves as needed, I don’t have to make 2 of each same fabric pairing. I can also lay out my triangles on my design wall and swap around as needed, which I can’t do if I use the HST-like method. That’s a big plus when making a quilt like my Slip Stitch quilt. I laid it all out on my design wall before I sewed my HRTs together, then took a step back and considered my colour placement. I could move the rows up and down as I wanted because the triangles hadn’t yet been joined to their partners. So let’s get on with the sewing, shall we? The longer and skinnier the half rectangle triangle, the trickier it is to trim. The squat, wider types are easier. I thought I’d go with a harder example, so it can only get better from there! Above: the guy on the left is easier to trim than the guy on the right. I’ll make a unit with each diagonal orientation so you can see how they both work. I’ve taken two sets of low-volume and purple rectangles that are 2-1/2″ x 7″ (more on initial rectangle size later). Each pair of rectangles has a diagonal cut in the direction required (as determined by your design). Each pair of rectangles can made 2 HRT units, but I’ve set aside the the extra triangles for the time being. First sew the halves together – the important thing to remember here is to offset the halves by a quarter inch. The easy way to remember this is that the pointiest points need to point over the edge. Silly, I know, but it’s how I remember these things (perhaps explained by my wine comment, above). You can see below the triangles have been matched right sides together, but offset from their halves by a quarter inch (I do this by eye, I don’t measure it). The pointier points (i.e. the more acute or sharp angles) are past the edge of the wider (more blunt) angles, both top and bottom. 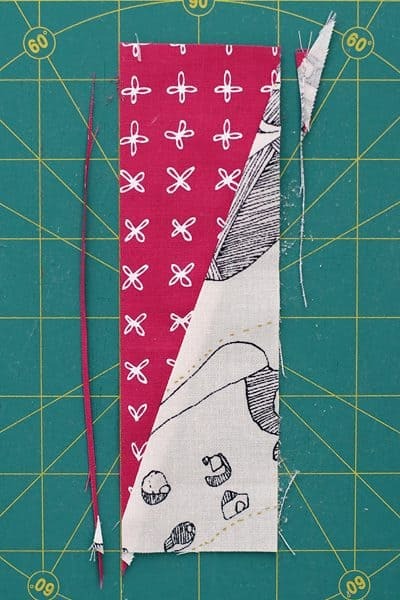 You can pin (or not) and then sew a quarter inch seam to join the two halves. Press the units as your design requires (you may want to nest seams, or prefer the flexibility that open seams give). Now we’re ready to trim up. These rectangles will yield un-finished HRT units that are 2″ x 5″. Once finished (sewn together), they will measure 1.5″ x 4.5″ (a ratio of 1:3). Start at one of the corners with a diagonal. Line up one edge of the ruler with the long edge of the HRT. Then slowly slide the ruler (keeping the ruler/block edges lined up) until you find the spot where the diagonal is exactly a quarter inch from the long edge. Taking a closer look at the diagonal, below, you can see it falls directly under the intersecting quarter inch marks on the ruler. And if the diagonal is exactly a quarter inch from each side then it will make a nice point when it is sewn to its neighbouring blocks. So we trim here. Now the half rectangle triangle unit is rotated around to trim the opposite end. 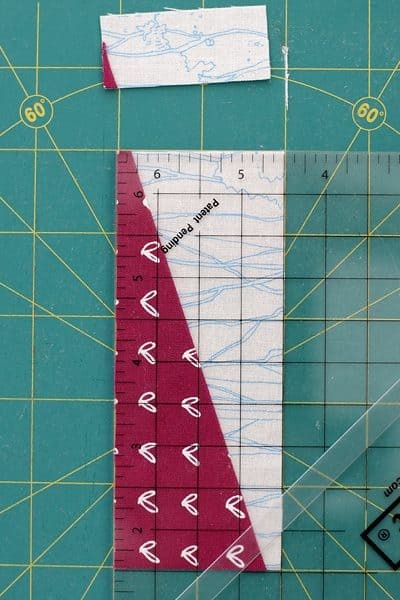 Again, the ruler is kept flush with the long edge of the HRT and the diagonal must fall under the intersection of the quarter inch ruler marks. We can also see that the HRT is 5″ long, as required. Then flip the HRT around to the other side and…oh no: I’ve measured my block to be 5″ long, but the diagonal isn’t falling right under the intersection of the quarter inch marks. This is why the longer, skinnier blocks can be trickier to trim. Because that angle is so much sharper than the fatter units, it’s easier for it to be a touch off. An additional, trouble-shooting step I like to include before trimming long HRTs is to centre the unit on my cutting board such that it spans the length I need. Below you can see my scissor tips are marking out 5″ and I’ve centred the unit on this, eyeballing the ends so even amounts of “point” overhang the 5″. Then you can quickly check the diagonal at each end before trimming and move the unit a little if a bit of fudging is required. A note on calculating the starting size of your rectangles for your half rectangle triangles. HRTs with a side ratio of 1:2 are not only easier to trim, they are also easier to calculate starting rectangle sizes for. (Finished Width + 1″) by (Finished Length + 2″). 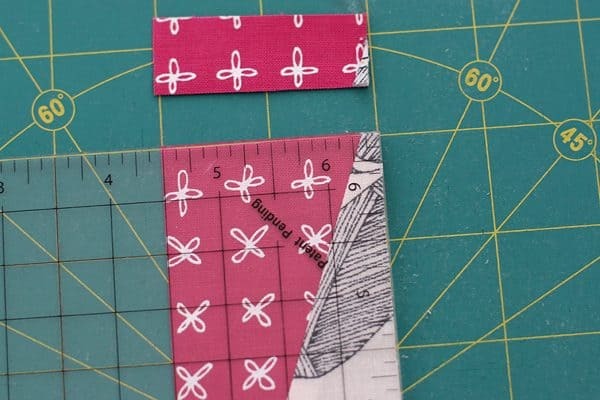 So if you want a half rectangle triangle that is 2″ x 4″ when it is sewn into a quilt, you will need two starting rectangles that are (2 + 1) by (4 +2) or 3″ x 6″. Easy peasy. Thank you, half rectangle triangle calculator. That will also sign you up to my newsletter, which means you won’t miss out on new tutorials or pattern releases. Yay! When making non-1:2 HRTs, you’ll need to make a guess as to the size of the starting rectangles and go from there. I usually apply the same formula (add 1″ to the finished width and 2″ to the finished length) and make a test block. Then it’s just a matter of testing and adjusting. If the block is too long when you trim, reduce the length and try again. This was exactly how I tested for the starting rectangles for my 1-1/2″ x 4-1/2″ (finished) block. 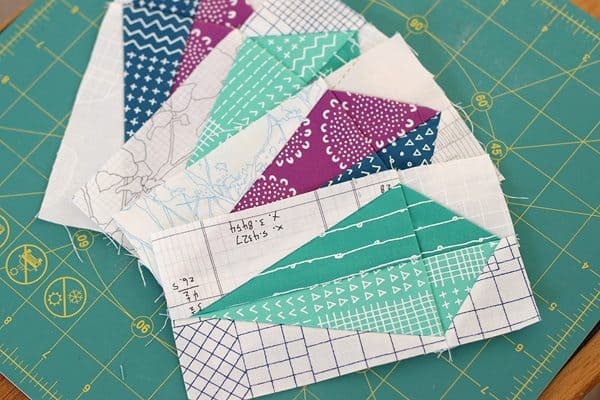 Alright, if you’re still reading then you are definitely ready to get out there and sew up some half rectangle triangle quilt patterns. As well as the patterns in my shop, I also have a free scrappy half rectangle triangle quilt pattern over in this post here, if you’re interested. Hopefully this post has helped start you on a half rectangle triangle journey. Be sure to send me an email if the 1:2 HRT size you need isn’t included on the PDF download – I’ll be happy to help you with that. You are a genius and a life saver! I can’t thank you enough for this post! I’ve had a design with HRTs in my mind forever, but couldn’t wrap my brain around figuring out how to get them to end up a very specific size. Thank you thank you thank you! This is great! I have only ever made one quilt with HRTs, and loved it!! Love the trimming tips! Thanks!! This is SO helpful! Thank you Kirsty! You are a marvel! Looking forward to the mini HRT too! The only thing now is to stop thinking of these as hormone replacement therapy!!!! Terrific post. I love oversizing my blocks and then trimming them to size. HSTs are easy, and now you’ve made HRTs easy. Thanks so much. So glad I follow you! Thanks Kirsty, I now know what to do with one of my unfinished sort of top: unpick the lot! Cut every piece in the right size and sew it all together again. This will be a lotof work and satisfying, because it will be a beautiful quilt! Thanks a million for new inspiration!! I absolutely ADORE HSTs, so I know this will be a match made in heaven! Thanks so much! You are my new best friend!! I’ve never seen a tutorial on HRTs before and you did a fantastic job of explaining them. Thanks. I foresee some of my scrappy charity quilts having kites in them! Is it possible to make templates for HRT’s? Or must one go thru this scary-to-me process? Thanks. You make it all very doable. Well done! Thank you so much. My goddaughter is due in September and she wants in blues and Grey’s but all she found was a picture. You are awesome! I just found this tutorial – it’s good, thanks! And I love that slip stitch pattern, great work! I finally got around to reading this post after skimming through it when first published. 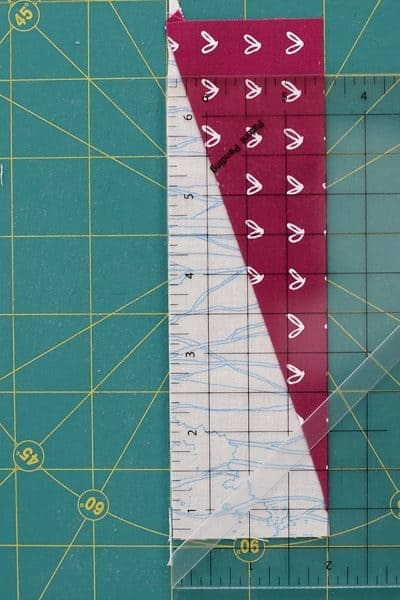 You have provided such a great tutorial for this super block, without having to purchase a specialty ruler, and I’m going to try it out this afternoon. I can see a lot of possibilities for this. Thanks for the great information! Thanks, so, so much!! This is the best news since cherry cheesecake. Very clear and with pictures illustration, too. What everyone else said PLUS. You are a life saver, I was ready to give up on the block I wanted till YOU. I’m having a rough time sewing these triangles as the cuts are slightly off bias. The bottom layer just wrinkles and folds. I’ve tried pinning in 5 places (worse then zero pins), adjusting top tension to every single setting, rethreading bobbin and top thread, different needles, everything. Any suggestions? I am so frustrated with this!! 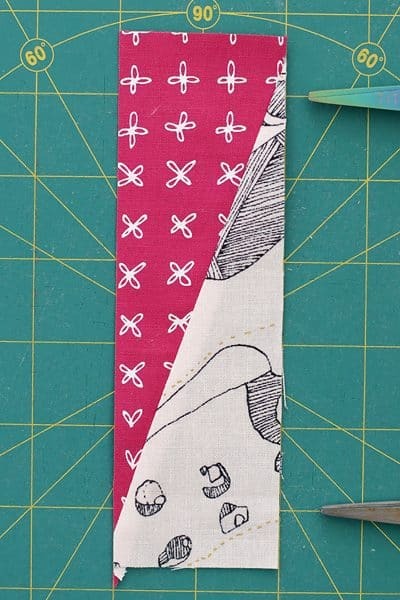 I was trying to make an outside border for a quilt using alternating direction HRTs; wide ends joining wide ends and short ends joining short ends to end up with an interesting and “framing” border. I made them as you said, however I only ended up with blocks that would make the top left and bottom right corners. Why didn’t half of the blocks end up as reverse of the other since I had the blocks opposites when I cut the original triangles? Thanks for the tutorial, it is exactly what I ended up doing to make mine, however I didn’t add enough length the first time so had to do it again. I would send you a photo of the pattern I am trying to create with this border but can’t see how to do that here. Hi Linda, it sounds like you needed to cut half your rectangles one way (top left to bottom right) and the other half of your rectangles the other way (top right to bottom left). 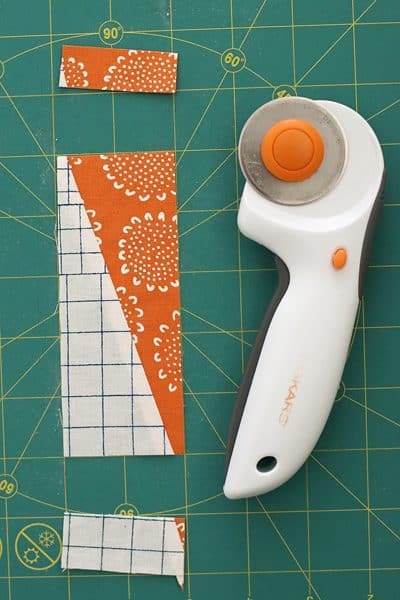 You might have accidentally cut them all the same way, or if you are using solids, where the back looks like the front, you might have accidentally flipped them over before sewing. If you do that, a top right to bottom left triangle will become a top left to bottom right triangle, and that would have lead to you not having the directions you need. I have done that myself a few times. Using solids can be a pain in that you have to always be mindful of “which way’s up”. But they’re also really handy because if you want to change the HRT diagonal orientation all you have to do is flip the fabric, rather than cut a new one. Hope that helps! Very great description of HRTs; they are super versatile and worth the time to learn how to sew and square up accurately. Thanks for linking up to the Tips and Tutorials Festival! I love the explication , i am always wrong with this block. I recently tried making an HRT. Failed. Thank you so much for this tutorial. I’m thanking you in advance for the chart I just requested. Also for this tutorial. I almost ordered a special ruler, until I came upon your tutorial. I never noticed that 1/4” box on the ruler. That is so cool. I will definitely be using that a lot. Thanks again. Thanks Barb, I’m so glad it’s helpful! 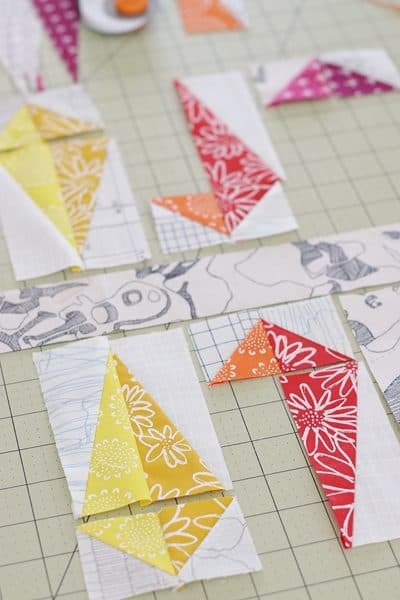 The easiest way I’ve ever made half rectangle triangles is a tutorial by Jacquelynn Steves of The Art of Home. So easy it’s insane. Check it out! Thanks Marcia. I’ve seen that method before (it’s the one I refer to in my post). It’s great that there are so many great ways to make such a fun and useful block. Thank you for all the really good info. I’m new at quilting & enjoy reading these blogs that help me learn new things. Keep up the good work , it’s appreicated. So glad it’s helpful, Beverley. Happy sewing! This is the best tutorial I have ever seen making these Half Rectangle Triangles! the fact that you showed us how to figure different sizes was so helpful! And trimming—best ever!! I know realize what I have been doing wrong all along. And for all that, thank you so much! Excellent tutorial, and thank you for including a lot of pictures. I seem to understand concepts better when they include them. Off to look through your shop.